Game art is basically all the visual elements you see while playing a game. Without visual artists there, the game would be nothing more than ideas in a designer’s mind if not lines of code on a computer. Game artists work closely with the game designers, producers, and writers to bring the game’s characters, stories, and worlds to life. Who Would be Interested in Game Art? Anyone who has artistic talent and wants to use them to create video games would be wise to look into game art. Being a game artist is one of the most rewarding jobs in the industry because you’re the one that gets to create the characters, objects, and scenery in a game. This can also include anything from clothes and surface textures to vehicles, weapons, monsters/enemies, visual effects, and even pre-production work like storyboards and concept game art. People who boast a lot of creativity and imagination would also enjoy a career as a game artist. This is because although comic books, movies, and tv shows can be pretty imaginative, they don’t compare to the interactive worlds of video games. There’s nothing quite like creating captivating environments and characters that players can actually interact with, explore, and get lost in for hours on end. Also, if you’re an artist who loves working in a team to make something great while collaborating with others, being a game artist is perfect for you. Whether you’re working with a small indie team or in a reputable game studio, game artists always work closely with other developers to make sure the game looks the way the main designers envisioned it. Keep in mind that the gaming industry is very demanding, which means working as a game artists might not be right for you if you don’t do well with milestones, tight schedules, long hours, and people constantly viewing and analyzing your work. When it comes to basic artistic skills like drawing and coloring, you can learn that yourself. In fact, with so many great online resources available in the form of video tutorials and free programs, it’s possible to break into the gaming industry as an artist without ever going to college. But unless you’re extraordinarily talented, you’ll want to go through a good art program. We say this because there are so many excellent college programs out there today that are doing an amazing job of training the next generation of game artists. Studying game art at a college or university will give you hands-on training in the same techniques and software programs used in actual studios. You’ll also be taught by talented professors who are either very good at teaching others and/or have professional art experience themselves. 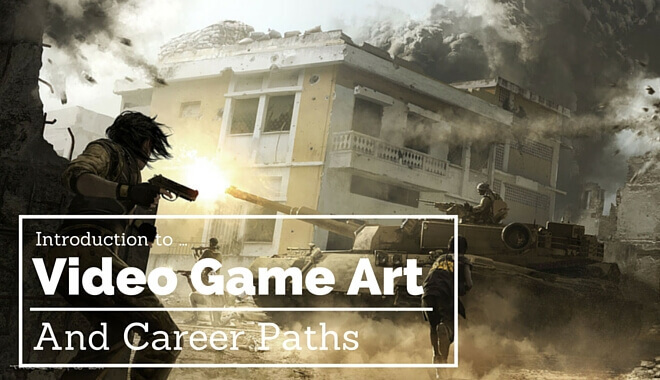 Since games are digital and thus require visual elements for everything, there are a wide range of careers you can pursue as a game artist. For example, character artists are hired to create either 2D character sprites or 3D character models, while environmental artists are in charge of creating the areas the player explores. 3D environmental artist are expected to create 3D models with texture, lighting, and color. There is also high demand for concept artists and illustrators in the gaming industry. They are important because they help the team establish the visual style of the game before production art is made. Most game studios also have one or more art directors that supervises artists and make sure their work goes along with what the game is planned to look like. They also provide art themselves while making decisions concerning the overall style of the game and any visual content produced.